At a news conference in Brussels, the president reversed his earlier criticism and said NATO is stronger than ever. Addressing a question about his consistency, he said, "I'm a very stable genius." "We are doing numbers like they've never done before or ever seen before," Trump said, at the close of the NATO summit in Brussels. The number that the president mentioned — 2 percent of countries' GDP — was in fact a main product of NATO meetings four years ago, when member nations pledged to move toward that threshold by 2024, a deadline that seemingly still stands after this week's NATO sessions. "It will be over a relatively short period of years," Trump said. After Trump spoke, French President Emmanuel Macron said nothing had changed from NATO's earlier commitment, despite Trump's claims. "There is a communiqué that was published yesterday. It's very detailed," Macron said, according to France 24. "It confirms the goal of 2 percent by 2024. That's all." In February, NATO Secretary General Jens Stoltenberg said only about half of the alliance's 29 members are on track to meet the 2024 deadline — which he said would boost spending by $46 billion. Only eight countries expect to meet the target in 2018, he said. Still, Trump celebrated both the 2 percent figure and his approach to these meetings, saying, "I think that NATO is much stronger now than it was two days ago." He also said the other leaders had thanked him for raising the issue of how to support NATO's operations. 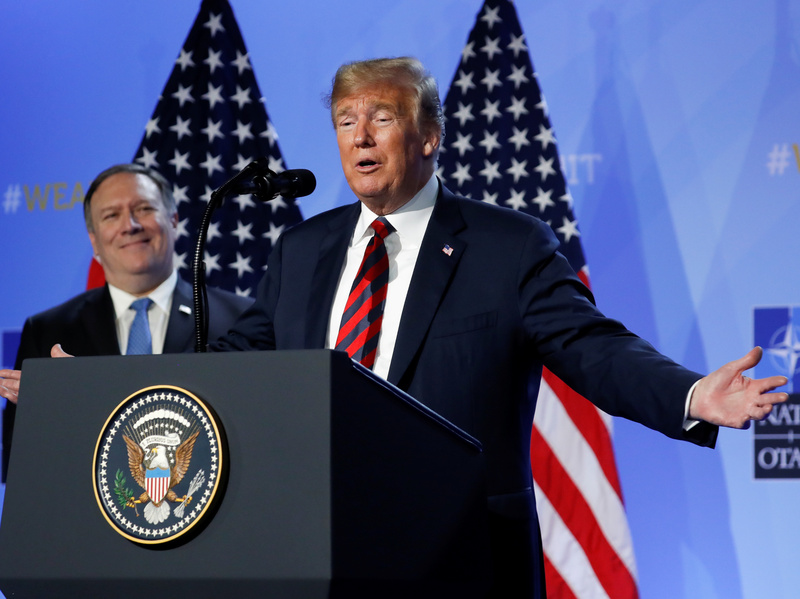 "Yesterday, I let them know that I was extremely unhappy with what was happening," Trump said, arguing that the U.S. has been paying more than its fair share to NATO. Describing the dynamics of the talks, he said, "I was using the term a lot today: burden-sharing." When Trump was asked about his threat to pull the U.S. out of NATO, he said that idea was no longer necessary and mentioned the member nations' financial commitments. Of the alliance, he said it was "very unified, very strong, no problem." Addressing a question about his consistency — and whether he might have less glowing comments about NATO on his Twitter account, Trump said, "No, that's other people that do that, I don't. I'm very consistent. I'm a very stable genius." Trump also reiterated his criticisms of Germany, which he said earlier this week was "totally controlled by Russia" because of a deal for a natural gas pipeline. "Germany has agreed to do a lot better than they were doing, and we're very happy with that," Trump said, without going into specifics. In the end, Trump said, the NATO talks concluded on good terms. "Everybody in the room thanked me," he said. "There's a great collegial spirit in that room that I don't think they've had in many years. They're very strong." Trump's comments came in a wide-ranging news conference after a special meeting on defense spending. He also discussed his upcoming meeting with Russian President Vladimir Putin, his efforts to broker a lasting deal with North Korean leader Kim Jong Un. and the immigration crisis that has been playing out in Europe. Trump said his summit with Putin, which is to take place Monday in Helsinki, would be a loose meeting with "no big schedule" but one that could still be productive. As for what he and Putin will discuss, Trump said Syria will be a main topic, as will Russia's attempts to interfere in the 2016 election that put Trump in the White House. When asked how that conversation might go, Trump said, "He may deny it. I mean, it's one of those things. All I can do is say 'Did you?' and 'Don't do it again' — but he may deny it." Before meeting with Putin, Trump is visiting London and the U.K. — where many large protests are planned against his policies. "I think it's fine," Trump said when asked about the protests. "I mean, I think they like me a lot in the U.K., I think they agree with me on immigration." Trump also reiterated an earlier comment he made about this trip, saying of his meetings with America's European and NATO allies and then Russia's leader, "Putin may be the easiest of them all. You never know." Trump said that Putin is not an enemy but "a competitor" — and that while he doesn't see the Russian leader as a friend, "I think we get along well." In response to those ideas, Sen. John McCain, R-Ariz., took exception. "Putin is not our friend nor merely a competitor," McCain said via Twitter. "Putin is our enemy .... He chose to invade Ukraine & annex Crimea. He chose to help [Bashar] Assad slaughter Syrians. He chose to attack our election & undermine democracies around the world." During Trump's meeting with Putin, McCain said, the president "must reverse his disturbing tendency to show America's adversaries the deference & esteem that should be reserved for our allies."